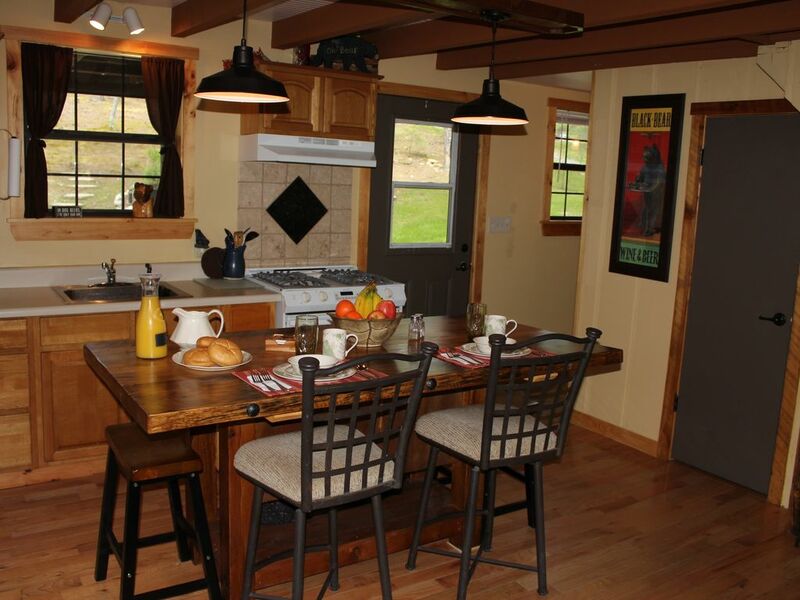 The 'Ole Bear' is a secluded, pet friendly fully furnished 2 bedroom 1 bath rustic mountain cabin with all amenities. Located in the southeast corner of Tennessee, surrounded by the Cherokee National Forest and nestled between Georgia and North Carolina, it is just minutes from the Cherohala Skyway and Tail of the Dragon famous touring loop. With a backyard filled with hundreds of miles of recreation, the 'Ole Bear' is the perfect destination for a romantic getaway, family vacation, or an adventure filled weekend. Relax in a large porch rocker on the private wrap around porch with views of the Unicoi Mountains while listening to the beautiful sounds of water in Historic Coker Creek or enjoy the song of the Whip-poor-will while eating at the outdoor dining table. The outdoor fire pit can be enjoyed from the overlooking porch or the seating surrounding it. For the adventurous the 'Ole Bear' is surrounded by mountains, waterfalls, lakes and streams, hiking trails and scenic drives. You can enjoy a ride above the clouds on the nearby Cherohala Skyway or wind your way up Chilhowee Mountain on the Ocoee Scenic Loop, the first designated national forest scenic byway in the nation. Catch a wily trout at Bald River Falls or hike through the mountains to any of our 12 waterfalls . None of that is of interest...... how about whitewater rafting and zip-lining, motorcycle touring, fishing, golf, gold panning, mountain biking, kayaking, horseback riding!?!? Amenities - A/C and gas fireplace, fully equipped kitchen, linens and towels, washer and dryer, TV/DVD combo w/ Chromecast, Amazon Fire Stick, Youtube TV, high-speed WiFi internet, Cell service via WiFi, fire pit w/firewood furnished, walking trails on property, gas and charcoal grills. In 2010 while on vacation from Florida, my husband and I found a beautiful property in the East Tennessee mountains to build our vacation cabin. After retirement as a School Administrator, years of traveling and building nearing completion, we shifted gears and decided to make our cabin our permanent home. So, in 2014, we packed up our two rescue dogs and moved full time to this beautiful area. We haven't looked back since. In 2016, fearful of running out of projects (lol), we purchased an adjacent property with a long time vacation rental in need of work. After months of blood, sweat and yes, some tears we are ready to re-offer "This Ole Bear" to vacationers of these beautiful mountains. My husband and I are long time RVers and love to travel and explore. Taken by the beauty of this area, we searched for an RV friendly property that could serve our needs for a few months out of the year. We found the perfect property in the Cherokee National Forest a short distance up a mountain over looking a beautiful creek with a rich history and some of the most scenic falls right down the road, but..... restricted against RV's. Convinced this was the perfect location for us we built our dream vacation cabin instead. It truly was a labor of love that we never regretted. "This Ole Bear" was planned and furnished with you the vacationer in mind. Purchased and renovated in 2i016 and made available September 2017 as a full time vacation rental, a guest of This Ole Bear will have access to the entire cabin and surrounding property to enjoy. Why vacation in someones part time home when you can stay in your own mountain retreat? Whether you are looking for a remote setting for a romantic outdoor candlelight dinner overlooking a massive stone fire pit or a destination for your adventurous family with a private upstairs suite for the kids, the Bear has it all and more. Romance or kids not your thing, check out This Ole Bears' backyard with its hundreds of miles of recreation. The Tellico Plains and Coker Creek area offers hiking, backpacking, equestrian, fishing, white water rafting, mountain biking, motorcycle trails and roads, historical sites and museums as well as steam era railroad tours, antiquing and flea markets. What a wonderful vacation getaway! This cabin was amazing! Rosemary’s special touches made the cabin perfect. Coker Creek right outside made for a pleasant and serene setting and restful sleep! Very possibly the best vacation we’ve ever taken! I didn't expect how great this experience would be. Rosemary is a gem and her kindness is present in every corner of this cabin. We made a mistake by not staying longer, but intend to correct that error by coming back later this summer-fall. This cabin was everything I expected from the pictures to the past reviews. Rosemary was very responsive to messages and greeted us upon arrival. Cabin was clean and comfortable. Loved that it was charmingly decorated without being cluttered. All the information regarding the surrounding areas was extremely helpful to us when planning our days. We will definitely be back. Thank you Rosemary for the use of your wonderful cabin, we left well rested. What a perfect little cabin! The pictures reveal a nice little cabin, but the pictures do not adequately reveal all of its charms. The cabin is up-to-date, clean, comfy and homey. You walk into the front door to find lights and music playing and a personalized welcome sign. While it is a snug little cabin, it does not feel too small. You don't feel cramped in any way. The living room flows onto the wrap-around back porch to reveal a lovely slice of mountain view with the sound of a rushing mountain stream at the bottom of the hill. The living room furniture is very comfortable and the beds are just right - as Goldilocks would say! Everything that is needed for cooking is provided and then some. Our hostess came to welcome us our first afternoon and had provided a lovely welcome gift of wine and crackers and cheese. We felt instantly at home. The weather was mild during our stay, so we were able to enjoy the outdoors. We used the fire pit twice and enjoyed the view and sound of the stream. We did not visit any of the local attractions, but the area is full of beauty and history. It was one of our best VRBO vacations by far! Thank you for a wonderful beginning to our new year. As we got to the cabin, Rosemary came down and met us and gave us a overview of the cabin and all that was available. She and husband Larry are wonderful. We walked in to find a Bear on the coffee table welcoming us to the cabin with the message "Howdy to the Creggers" on its side. As others have noted there was wine, cheese and crackers as a welcoming gift. The cabin is just like the pictures and very cozy and warm. Everything is there that you could possibly need or want. Don't see it, look around it's probably there somewhere. During our stay the weather was cold, so we didn't get to use the back porch or the fire pit, but did notice that there was a bluetooth speaker on the porch that you could use while sitting out enjoying the outdoors. The grill is small but just right for up to 4 steaks or pork chops that we cooked. We will definitely be back to the Ole Bear.